Product Overview The Hummingbird is a choppy, sawtooth tremolo modeled on the vintage “repeat percussion” unit and similar to those found in old Valco and Vox amplifiers. It is capable of producing everything from classic “50’s style” shimmering tremolo to a synthy, delay-like chop that turns your signal into a burst of short pings and on through to near ring modulation speeds. Simply choosing between modes 1 (slow), 2 (mid-tempo) or 3 (fast) and adjusting the rate and depth controls will unlock a whole new world of amplitude modulation at your feet. The Rate is also expression pedal accessible to allow instant changes on the fly. Using an expression pedal opens up the possibility of true random amplitude modulation! In addition to the modulation, the Hummingbird has plenty of clean gain on-tap allowing you to either boost or cut the signal using the level control. 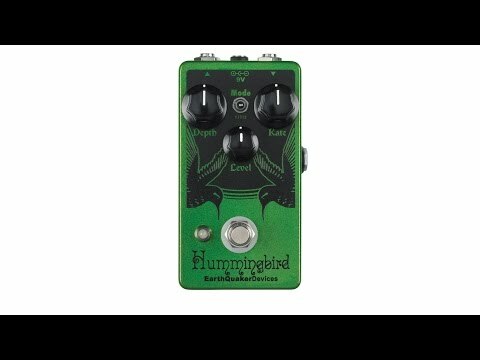 If the Depth is turned to zero, the Hummingbird will become a JFET clean boost! • Depth: This adjusts how much the oscillator affects the signal. All the way clockwise produces a full chop, all the way counterclockwise produces no chop and the Hummingbird can be used as a simple JFET booster. • Mode: Three way toggle switch which selects the range of the oscillator. Mode 1 is slow, Mode 2 is mid tempo and Mode 3 is fast. • Rate: This adjusts the speed of the oscillator. Faster clockwise, slower counterclockwise. • Expression Jack: Use an expression pedal to adjust the rate with your foot! When an expression pedal is in use the Rate control is defeated. We recommend the Moog EP-2 expression pedal. • Flexi-Switching: This device features Flexi-Switch™ Technology! This relay-based, true bypass switching style allows you to simultaneously use momentary and latching style switching. Since the switching is relay based, it requires power to pass signal.